Mom Has Icky Bananas. Does Anyone Else Have Winter Ickies to Share? Hi kids. It’s me Pugsley. I’ve been just plain icky. I’m STILL digging out from the last snowstorm here in the East. It’s way over my head and I don’t like it. I miss grass and all the grass smells. God make it stop snowing will you please? As for other icky things, I’ll bet most of you completely forgot about this auspicious occasion. It’s one year since my tussle with the evil chicken girl and my surgery. I still get all twisted when I think about it. Who’s laughing? Is that you Pooky? I hope mom gets me a cake tonight. Any reason to eat cake works for me! A few weeks ago mom drove by my hospital and thought that it had been such a long time since we had been there. Big mistake! She jinxed the universe. Bad mom…. Last weekend, mom opened the front door to go out and shovel the snow and our neighbor Ms. Alice was at her door so I did what I always do; I ran out of our house and into hers to visit. I hung out in the kitchen looking for snacks. When mom came in to get me, she noticed some icky rat poison pellets in a tray on the floor and some pellets next to the tray. She didn’t know if I ate any so off we went in the snow to the ER, but not before I left a fudgy on Ms. Alice’s carpet. <giggle> I told mom that I didn’t eat any icky pellets, but she wasn’t taking any chances. When we arrived, I felt like such a celebrity. The nurses came to the waiting room and they all yelled, “Pugsley!” It was just like at Cheers. Everybody knew my name! They asked me what I ate now and took me right back to an exam room. I also told them that I didn’t eat any rat poison. Doesn’t anyone speak Dog? So I had to get checked out….I’ll spare you the details….and then mom took me home. SEE I TOLD YOU I DIDN’T EAT ANYTHING THIS TIME!!!! What an icky night that turned out to be. My cousin Fred was in the ER a few weeks ago too. He said that was really icky. Hey Cousin Fred, did you have to wait long to be seen in the ER? Next time you should go to my hospital. I can call ahead for you. I think I overheard one of the nurses say that I should get a frequent flier card there. I’ll bet only the most important patients get those. One kid Rufus asked for my autograph. I wasn’t in the mood. Mom came down with the ickies too because of all the gray skies and snow so Aunt Elly came over last night to rid us of them. I was so excited to see her that mom said I acted like a lunatic. I prefer eccentric. I grabbed her shoe and ran around the house with it. I don’t even do that with my toys. Aunt Elly said my chakras were congested and my energy was stuck. OH NO – I HAD STICKY ICKIES! <hee hee snort> It was that chakra charm Aunt Elly. You were hypnotizing me. So now mom and I feel much more grounded and our energy is balanced once again. Ahhh. It also helped that that big yellow orb showed itself in the sky for a few hours this afternoon and it was warm. I’ve missed my friend the sun! Mom also started PT for her back. She has exercises to do at home and I help. I figure that she’ll get quicker and better results if I sit on her while she does her leg lifts. It’s like being on the rides at Six Flags. Another thing that mom did, which I don’t understand at all, is take a class in Icky Bananas. Why would you need a class for that? You just let the bananas hang around a week too long and they get smelly, mushy and icky. Oh wait. It’s not called Icky Bananas. 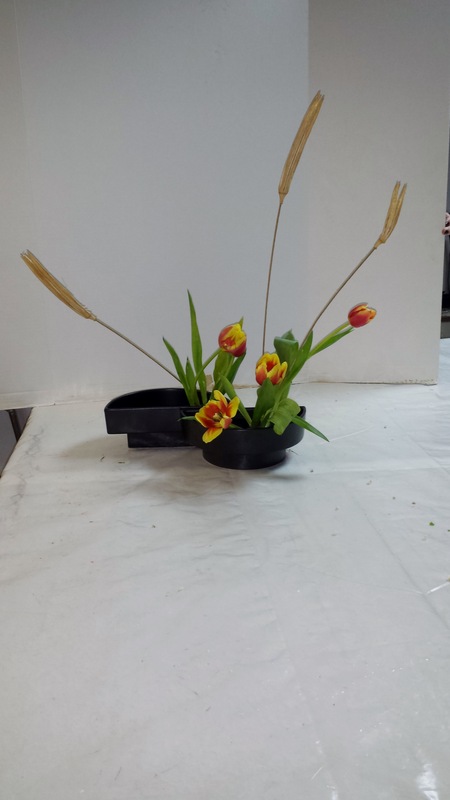 Mom says it’s called Ikebana and it’s Japanese flower arranging. It’s a minimalist art form in which nature and humanity are brought together. It dates back to the 15th century and it’s very precise. 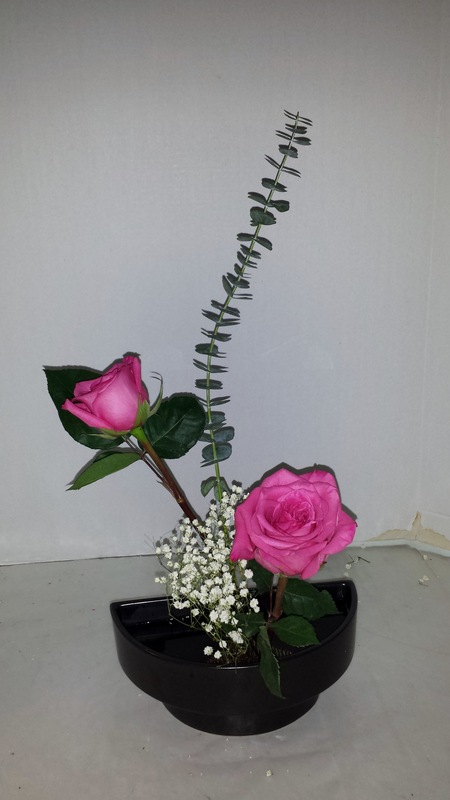 Mom took pictures of her first arrangements. Boy, they sure smelled better than icky bananas! Has anyone else been watching the Olympics? I’ve been practicing my Slopestyle on the banister. Mom said if I break a leg, I’ll have to get a different ride back to the hospital because she refuses to tell the nurses and the doctor how it happened. Worse yet, she thinks the hospital will post our pictures and she doesn’t want to be the Patient of the Year’s Mom. That would be really icky! Just wait…..here I come PyeongChang! So share your winter ickies with me. I’ll repost the really icky ones.